What is display advertising or banner advertising? > What is display advertising or banner advertising? As before, the banner advertising is one of the most popular online marketing tools. In the case of traditional banners usually graphical, advertising messages moved on non-company websites, places or rented. Behind the banner usually puts a link that leads to a click on the banner to the corresponding offer (ie landing page of the advertiser or eShop company). For the Internet, there are many different banner sizes. The best-known example, but include full-size banners and skyscrapers. Over time, these have been supplemented by a wide variety of different formats, to the visitors of a website in the future to achieve the desired attention. In addition, there are other types such as nano-site, streaming or pixel banner. Great popularity among advertisers (advertisers) are nowadays banner with Flash technology. These banners can be counted among the rich media formats. They allow advertisers more flexibility in the design of the banner. Most in these banners expire animations, aiming to attract the attention of visitors and this ultimately discourage them from doing what he had planned to. A phenomenon that is called "banner blindness", reflects the rejection of this form of banners by the Internet users. It occurs especially among experienced Internet users, and means nothing more than that all the banners or content in any manner flashing, lights, etc. are animated or simply ignored, or simply no longer be recognized. Ad blockers are often used to prevent particularly annoying ads. Basically corresponds to the banner advertising the ads you get from magazines and newspapers. Just like in the offline world, it is used to this increase in efficiency, you not just to select the right promotional partner (here platforms on the Internet, "Publisher"). For example, a banner ad, which aims is to bring products on infants to the customers, on a website which has mainly parents as visitors, are more likely than clicked on a site that deals with Formula 1 race. Furthermore, one must be aware that they are usually several sight impressions (ad impressions = commercials) takes exactly to someone at that moment, the product needs, or at least has an interest, where there are various technical options that allow intended to increase the efficiency of the banner advertising. In addition, this form of advertising mostly from agencies, ad networks, ad exchanges, and marketers controlled, monitored and accounted for. Respect them usually also ensure that advertising categorize (the power behind it) and to expand on relevant topics drawn websites of your portfolio. Nevertheless, one sees on the Web often undirected advertising. Here it is probably because of her weight instead of targeting. Here are billed to view contacts (ad impressions), with a certain amount or price of 1,000 ad impressions is determined. For example, if a page loaded by a visitor once and thus the banner, which is represents a visual contact The CPM is based on one thousand impressions. Once it is detected that the CPM for the advertiser often represented only an inadequate accounting model because too few visitors actually clicked on the ads, a fairer pricing model was introduced (CPC). After that, the advertisers only pay for actual clicks to carry the banner (ad clicks). To measure the success of a campaign, the CTR is used (click trough rate). It measures the CTR of banner by the number of clicks is set in relation to the ad impressions. Click for example, 10 of 1,000 visitors on a banner, the CTR is one percent. At the click trough rate is added, the conversation rate. It does not measure the click-through rate, but the proportion of "converted" customers. Ie here the number of visitors is measured, the clicked on a banner and then actually. A predetermined action, such as have performed a purchase, To continue the example above: 10 out of 1,000 people have clicked on the banner. Here we had a CTR of one percent. Now leads one of the ten people from a particular action, the conversation rate is 10 percent. 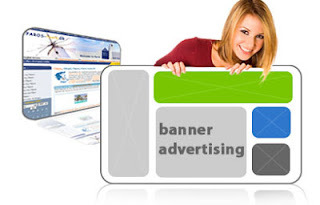 Banner advertising has lost in recent years increasingly in favor of other forms of advertising on the Internet in importance. Nevertheless, they will continue to play an important role in the online advertising take. The display ads are intelligent, interactive and social. The banners will be in the future consist of multimedia forms, which will adapt to the information of the internet users and thus much more focused than before. The environment of social media will play an important role. Experts believe that the ads are now mostly from the more passive observer commented, and shared, just as you would know it from movies or news. What development looming here specifically is remains to be seen. Certainly it can be said that in the future with banner ads will be expected.